Radioactivity history for radioactivity century and 20 years of LAPP. This page is a private initiative and is under constant improvement. According to the author, the historical or scientific informations it contains are right. 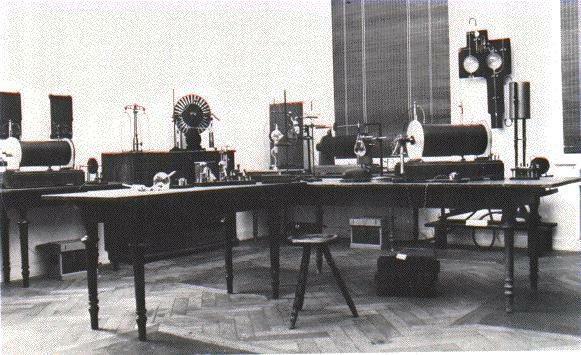 Many informations concerning the radioactivity century can be found at the Comite National pour le centenaire de la radioactivite or at the Comite Rhone-Alpes or on the site of radioactivity. 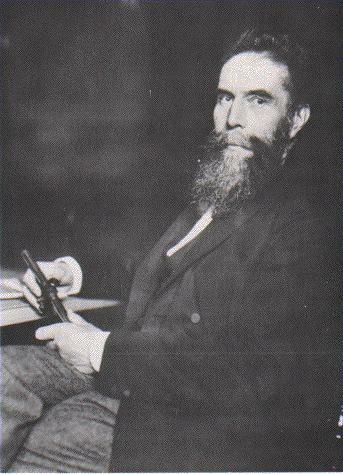 All begins in fact in the year 1895 with the discovery of a prussian professor, director of the Wurzburg Physics Institute: Wilhelm Roentgen. On the 8th of November, he covers with a black strong paper an apparatus that he uses to study electricity phenomena and he sees a surprising phenomena: the screen placed nearby seems shining some green light. Moreover, his hand placed behind the screen shows the shadow of his hand-bones! Very surprised, he repeats different experiments during all the month of December, speaking to nobody, saying just to his wife that what he is studying will make people think that he became creasy! Only at the end of December, he publishes a short article, claiming for a fantastic news: the existence of an unknown and strange radiation, that is thus quickly named "X rays". For this discovery, he receives the first physics Nobel price in 1901. Today, those "X rays" are well known to be a particular type of light, that is photons of high energy, greater than energy of UV. 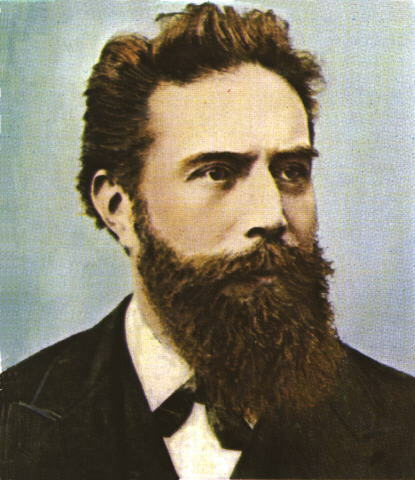 This discovery is a big thunder in the sky of physicists and Roentgen is asked everywhere to demonstrate the existence of X rays; mediatic travels and shows that he will almost all refuse. Two or three years later, he stops the study of X rays. His part of work in the story finishes. 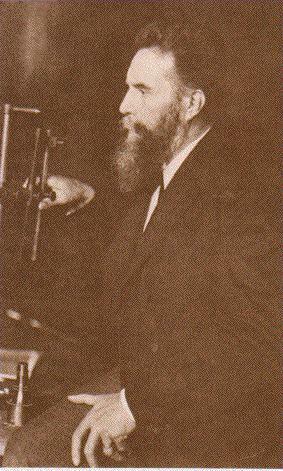 Henri Poincare, very excited, gives a communication about the discovery of Roentgen, during the weekly session of the French Science Academy. 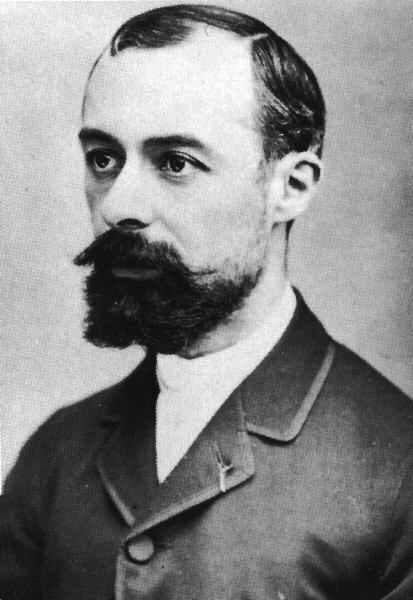 Henri Becquerel is there and decides to study the existence of a possible relation between those famous X rays and the fluorescence phenomena. In those times, he was studying the fluorescence of uranium salts. Once exposed to the light of sun (thus to UV photons) those salts can radiate visible light: this is called fluorescence. He carries thus his uranium salts under the sun, places them close to photographic plates covered with black strong paper. The development of the plates shows that uranium salts radiates X rays, the only known radiation capable of impressing the plates through black paper. Fluorescent materials would be also X rays sources? The following week, the sky of Paris is grey and covered No way to expose uranium salts to the sun. 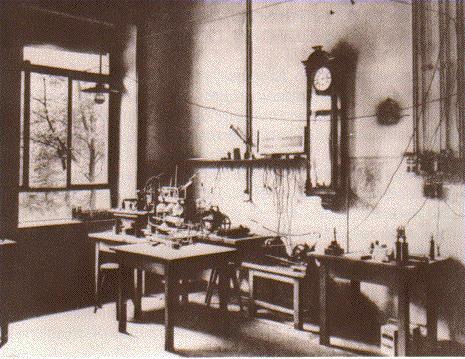 Becquerel stows his covered photographic plates and his uranium salts in a drawer. By "chance", the sun is absent during many days and the plates are left in the drawer during many days. 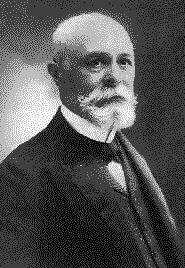 Finally, Henri Becquerel decides nevertheless to develop his unexposed plates. Very surprised, he remarks that the plates are impressed. A new type of radiation emitted by non fluorescent uranium has gone through the strong black paper. 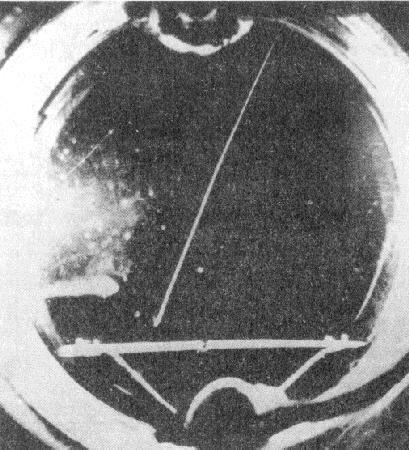 The shadow of the copper cross that Becquerel had placed between uranium and the covered plates is visible: the new radiation has not gone through it. 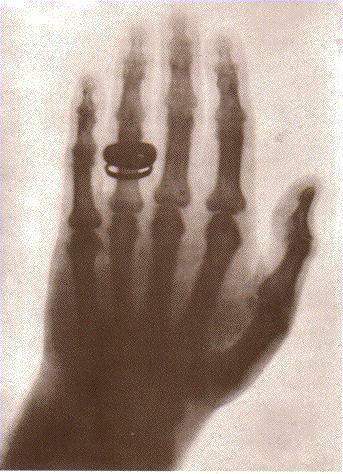 Photographic plate of Becquerel impressed by the radioactivity of uranium. Radiation emitted by some material at rest! Radiation spontaneously emitted without any trapped energy before!... What a strange phenomena! Becquerel baptises them "U rays" and continues to study those strange radiations, but only with uranium salts. It made him impossible to do the great step realised by Pierre and Marie Curie. For him, the play stops here. He has been "the lighter of the star". 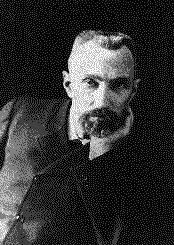 Some hundred meters from the "Jardin des Plantes", where is working Becquerel, a young polish woman, Marie Sklodowska has just get married with Pierre Curie, director of studies at the Physics and Chemistry School of Paris. She works with him in his small laboratory. Eighteen months later, she presents her PhD thesis about the U-rays (radioactivity) of Henri Becquerel. She shows that, like uranium, the thorium is radioactive. And, in July of 1898, with the help of Pierre, she succeeds in isolating a new material, a million time more radioactive than uranium, that she calls "polonium". Then, from penchblende ore (many tons! ), Pierre and Marie extract by hand some milligrams of an other new material, 2.5 millions times more radioactive than uranium: the radium. 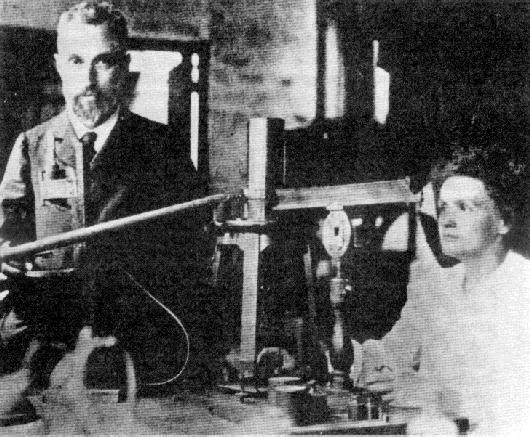 For this discovery, Pierre and Marie Curie receive the physics Nobel price in 1903. 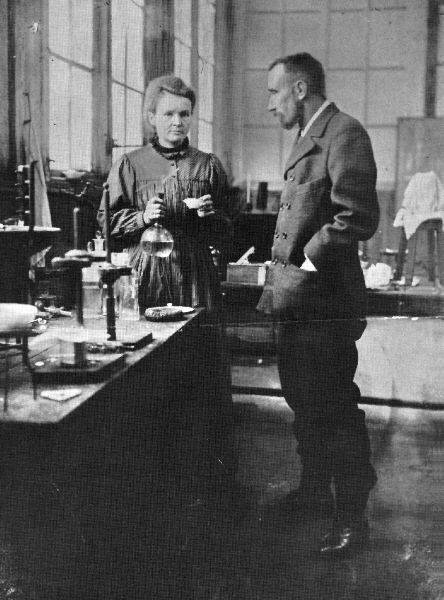 Some years later, Marie Curie, alone since the death of Pierre in 1906, isolates metallic radium with an electrolytic procedure and receives the Nobel price of Chemistry, in 1911. One kilogram of radium during 1600 years gives more than 60 billions of Joules, equivalent to the electricity consumption of a Paris inhabitant in one year! Where does this considerable amount of energy come from, like from a magic source?... 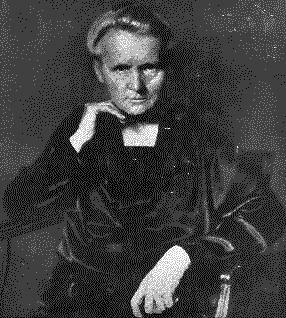 Marie Curie made the hypothesis that some unknown radiation present everywhere in the universe can be absorbed by the radium, which then reemits this energy as radioactivity. Now, we speak about weak interaction and strong interaction in order to explain radioactivity of atomic nucleus, but the idea of Marie was original and may reappears some day...? The next step of the story is made of long and patient studies, with many fondamental breakthroughs in understanding what is matter. Rutherford, Chadwick, Curie and Villard show that the emitted radiations are of three types: the helium nuclei (alpha radiation), electrons (beta radiation) or very energetic photons (gamma radiation). 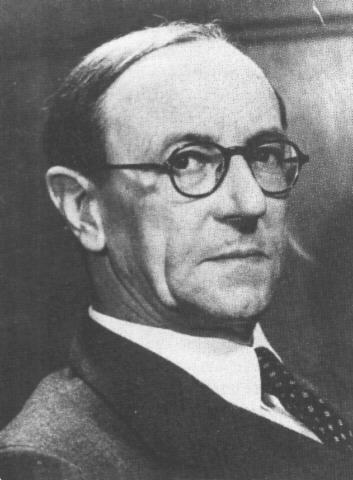 Then, James Chadwick shows in 1914 that the spectrum of the beta radiation (the strongness of emission versus the energy of the electron) is continuous. This is contrary to the fundamental principle of the energy conservation!... This mystery ended with the hypothesis of a new particle emitted with the electron of beta radiation: the neutrino. 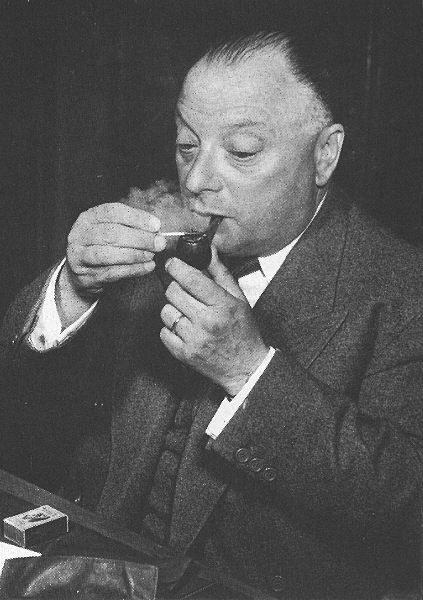 Wolfgang Pauli imagines this particle in 1930 for the sake of energy conservation principle and Enrico Fermi names it in 1933. 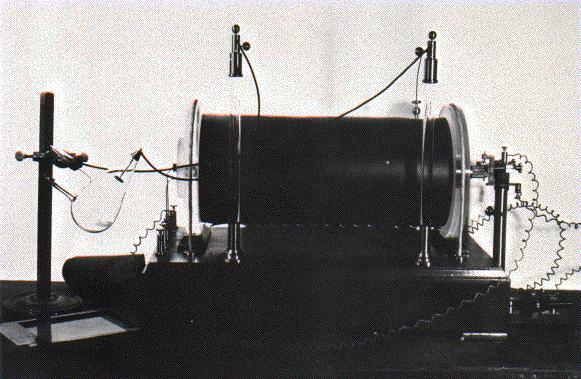 The neutrino will then be detected only in 1956 by F. Reines and C. Cowan. 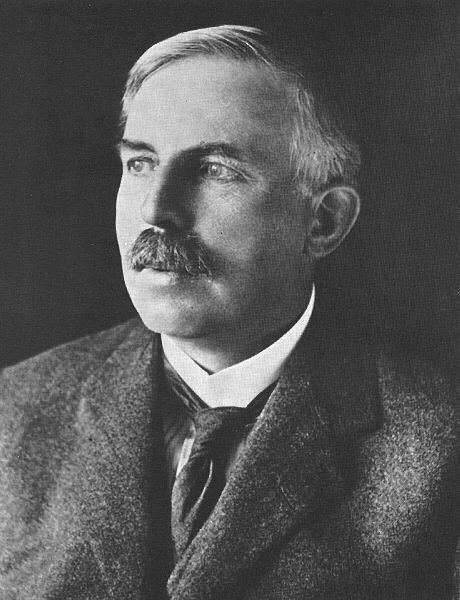 The atomic nucleus was discovered around 1911 thanks to, among others, Rutherford, Geiger and Marsden. The knowledge about it improves with a prodigious celerity: in 1932, James Chadwick discovers the neutron, while Irene and Frederic Joliot-Curie having observed the neutron decay, did not recognize it as a new particle of the nucleus. 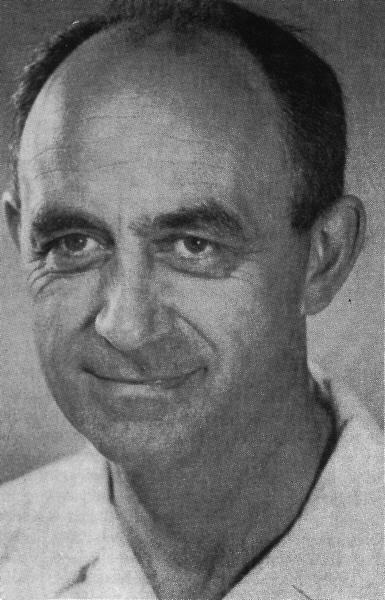 Later, knowing about the Nobel price given to Chadwick for the discovery of the neutron, Rutherford says, according to E. Segre: "For the neutron, it's Chadwick alone. Joliot-Curie are so brilliant that they will quickly have it for something else!". 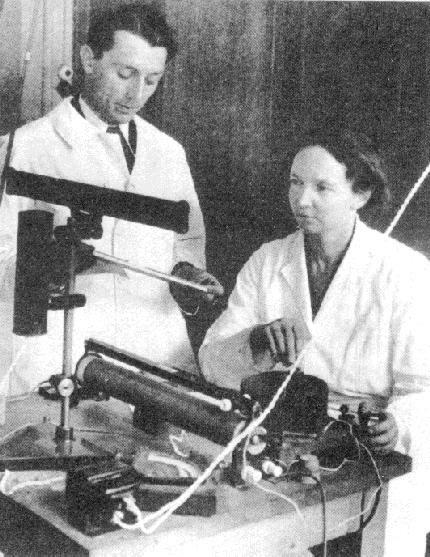 In 1934, Irene and Frederic Joliot-Curie discover the artificial radioactivity, making a great step toward the use and the control of radioactivity. For this discovery, they received the Nobel price of chemistry in 1935. Until this date, atomic nuclei emitting radiation were found in nature: it was called the natural radioactivity. 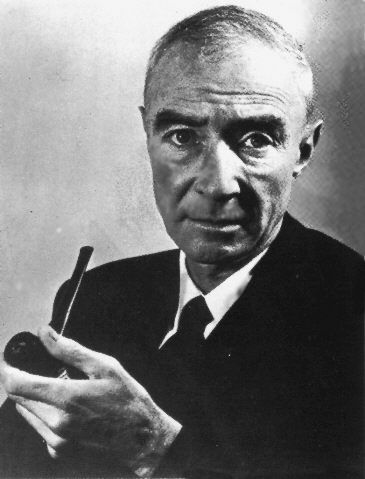 It had been known since Rutherford that this natural radioactivity changed a nucleus into an other one: for instance radium becomes finally lead after many radioactive decays. We could say that lead does not become gold but gold becomes lead! But... this change of matter was not under control. It was not possible to construct the desired chemical element as the alchemist dreamed... 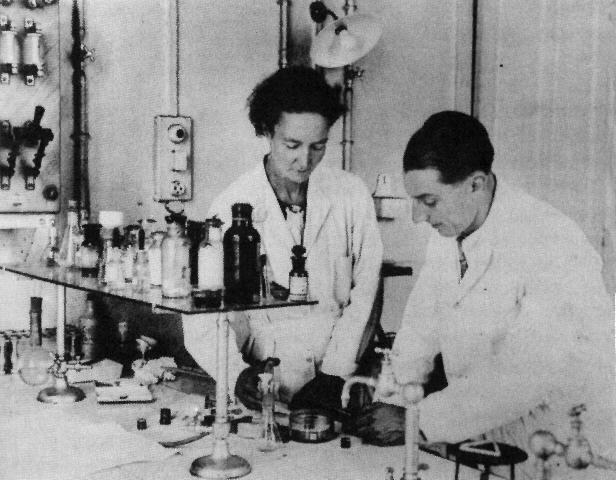 But Irene and Frederic Joliot-Curie, made the dream become almost reality. They were the first to show that mankind could build under control some news radioactive nuclei. By shooting an aluminium sheet with alpha particles (helium nuclei), they were able to make radioactive phosphorus, a new isotope of the stable phosphorus that was never observed in nature. They demonstrated it by chemically isolating the phosphorus produced before it becomes silicium by its radioactivity. The creation an unnatural radioactive element is what we call the creation of artificial radioactivity. In 1938, some physicists perceive the possibilities of the nuclear energy (badly named atomic energy). Hahn and Strassmann, two german scientists, demonstrate that the uranium nucleus can be cut in two parts: this is the fission of the nucleus. Some months later, Joliot-Curie and his colleagues Halban and Kowarski detects an emission of neutrons when an uranium nucleus is cut. Frederic Joliot-Curie even already forsees the huge energetic ressources that it could give to mankind. All his life, he will continuously fight for a pacific use of nuclear energy. In 1948, thanks to the energy and the willpower of Joliot, the first french nuclear stack, named Zoe, begins to run. It was stopped in 1976 and became a museum showing the story of the nuclear energy since Pierre and Marie Curie. Today, about 80% of the french electricity comes from nuclear energy. The big problem of radioactive wastes is not yet solved correctly, but since 1994, some serious works are made at CNRS or at CERN, to demonstrate the feasability of the coupling between a particle accelerator and a nuclear plant using thorium instead of uranium. This could produce less long lived radioactive waste and may be could give the possibility one day to "incinerate" the highly radioactive contaminants and wastes (instead of graving them 1 km under the earth surface). 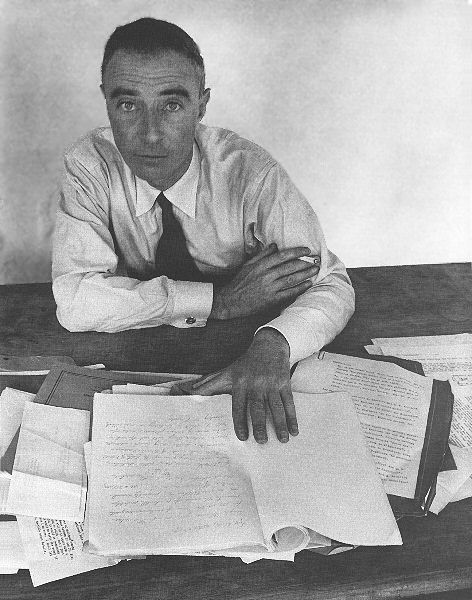 But this chapter of the radioactivity history ends also with the first nuclear bomb which exploded on the 16th of July 1945, in the desert of Alamogordo, near the town of Los Alamos, and which prompted Robert Oppenheimer, director of the Manhattan project to say, looking at the explosion: "God bless us, we have created something more awful than hell". This complete transformation of our century, which gave the horror of the two bombs of 1945 launched on human beings, was possible thanks to the discovery of radioactivity. But, don't blame the inventor of matches when pyromans use it to make criminal fires. Radioactivity and X rays are also used today in medical care, biology, archaeology, to restore antic art, to preserve alimentation, and so on... We can hope that new possibilities of benefic applications will be found tomorrow. This is true only with the strong following condition: scientists and responsable people must be able to keep wisdom in science and in the use of science discoveries. Since November, 4 1999: This site has been visited times.